Monrovia, Liberia - President George Manneh Weah who is in Dakar, Senegal on an official invitation to attend that country’s independence anniversary and the inauguration of its re-elected President, has been holding mutually beneficial business meetings with a couple of his counterparts. In separate meetings with his African colleagues and officials from other countries, President Weah has been marketing his Pro-Poor Agenda for Prosperity and development, pushing for improved diplomatic ties and discussing direct foreign investments. In just few hours upon arrival in the Senegalese capital of Dakar, the Liberian Leader was in a meeting with His Excellency Alpha Conde’, President of the Republic of Guinea at which time both leaders not only discussed improving diplomatic relations and trade between their two countries, but also possible Iron Ore deal where Guinea will transport ores using Liberian ports. Both Leaders and delegations were joined in the meeting at the King Fahd Palace by former French President Nicholas Zarkozy, who praised the two presidents for maintaining peace and stability in their respective countries and expressed interest in the mining sector in Liberia and Guinea. President Weah later on Monday, April 1, 2019 hosted Sahle-Work Zewde, President of Ethiopia. The two leaders stressed the need for improved diplomatic relations. President Weah used the meeting with President Zewde to accentuate his sympathy to the government and people of Ethiopia for the death of 157 people who died in a plane crashed last month. The Liberian leader said it was an accident because Ethiopia has one of the best secured air traffic regimes on the continent. He pleaded with his Ethiopian counterpart for Ethiopian Airlines to resume flying to Monrovia. He asked President Sahle-Work Zewde and other African countries to tap into Liberia’s warm and rewarding business climate. For her part, Pres. Sahle-work Zewde said she was happy that Liberia nightmares, including the civil war and the Ebola crises, were over. She pleaded with President Weah to consider reopening the Liberian embassy at a full status in Addis. The Ethiopian Leader stressed the importance for both countries to hold further meetings aimed at working out details for possible deals that owe mutual benefits for both countries. 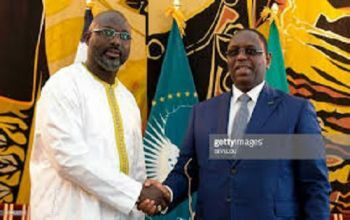 Earlier on Monday, April 1, 2019, President Weah arrived in Dakar, Senegal and was received on arrival at the Leopold Sedar Senghor International Airport by Senegalese Prime Minister, Mahammed Dionne. President Weah concluded the day’s activities by holding a close-door meeting with the President of Cote’ d’Ivoire, Alassane Ouattara. On Tuesday, April 2, 2019, the Liberian leader will join more than 20 world leaders in gracing the inauguration of host President, Macky Sall for his second term in office. President Sall won a 58% of votes during the Country’s February 24, 2019 General Elections in the first round. Tomorrow, April 3, 2019, the President and delegation will meet with several investors including executives of Group FESTO ALTAY, Global Green International Holdings and the Help Team for direct investment in Liberia. The President and other world leaders will attend Senegal’s Independence on Thursday, April 4, 2019. Senegal gained her Independence from France on April 4, 1960.